Classic ELO Band Concert Posters and Memorabilia! Buy Online Now! The Electric Light Orchestra‘s ambitious yet irresistible fusion of Beatlesque pop, classical arrangements, and futuristic iconography rocketed the group to massive commercial success throughout the 1970s. ELO was formed in Birmingham, England in the autumn of 1970 from the ashes of the eccentric art-pop combo the Move, reuniting frontman Roy Wood with guitarist/composer Jeff Lynne, bassist Rick Price, and drummer Bev Bevan. Announcing their intentions to “pick up where ‘I Am the Walrus’ left off,” the quartet sought to embellish their engagingly melodic rock with classical flourishes, tapping French horn player Bill Hunt and violinist Steve Woolam to record their self-titled debut LP (issued as No Answer in the U.S.). 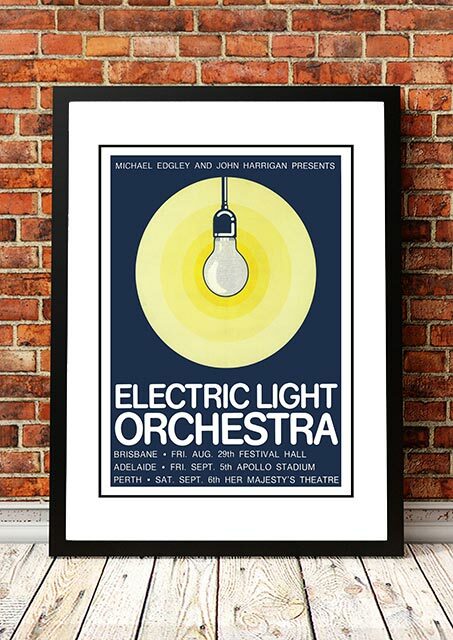 We stock some awesome ELO Band Concert Posters.